Taking a child's temperature is not at all easy. If you have reason to check, they are already warm, cranky, possibly vomiting, and always uncooperative. You might only get one solid crack at it, so it had better be accurate. 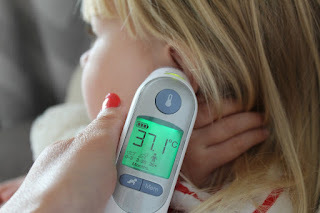 We discussed in the past the variety of different thermometer makes on the market, but my favourite by far is the ear thermometer. They might be the bulkiest variety, but when it comes to the clarity, the features, and quick results, the ear thermometer is king. That said, in my son's short life, we've owned three. The first was so difficult to understand, we returned it. I thought initially it was me not understanding how to use it, but thankfully, now that I own these two, I can see that the problem was the product and not the user! 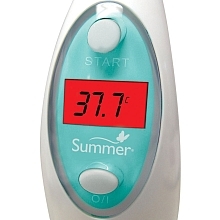 Both baby product wizards Summer, and medical equipment kings Braun, make excellent thermometers for different reasons. 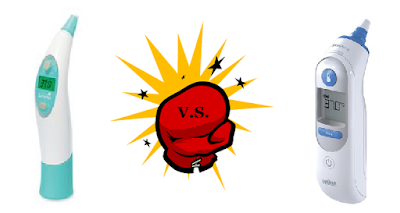 I think you would do well to own either of these models, but to help you narrow down which might be the better fit for you, today we watch them duke it out in a three round battle; ease of use, bonus features, and price! Summer: It seems like an easy enough process, but even after reading the instructions, I'm not 100% that we understand how to use this model correctly. My husband will press the start button, maybe 4 times before feeling that it has worked, while I hold the button down the whole time until it beeps. I'm not sure either method is correct, but it does work eventually. Braun: This model is super simple - it has a flashing light, so you can tell that it's calculating even in a dim bedroom, and the results come fast. Push the on button, insert in ear, push the temperature button, presto. It couldn't be more straight forward. Summer: The very best feature of this unit is the red/green indicator. While it, and most models, give you the temperature in either Celsius or Fahrenheit, sometimes neither makes sense when you are tired and anxious. If your child has a fever, the temperature comes up red, leaving no doubt of the results. The flashing green temperature indicator is a huge relief, reassuring you that all is well. Braun: This model has some bells and whistles, but for the average home consumer, I'm not sure you would use them. Of note; a 10 temperature memory for tracking temperature trends, and it comes with a package of protective tip covers. This would probably be handy for a home daycare or school use, but I don't think most moms need to keep track of an elaborate series of readings. Plus, a good wipe down and periodic thorough clean are sufficient. I can't see me buying replacement tip covers. Summer: At $38.77, the summer is a bargain. Most models are double this price, and with not that much more going for them. If you take the time to understand how to use it (or are just better with technology than I am), this is a totally decent model to have on hand or have as a spare for Granny's house. Braun: We managed to get our unit on sale for $69.97, but I have seen it priced over $80. This is the type of unit that you would put on your registry, because you might not see the value in putting it in your cart at Walmart with the other $700 of baby stuff you end up buying. That said, I can see this unit surviving multiple kids, so you might see it as more of an investment. So there you have it. When push comes to shove, I prefer the Braun. I wish it had the red/ green colour indicator of the Summer, but otherwise, it's a great product. Light, easy to use, and seemingly long lasting, it squeaks out a win over less expensive Summer, but not by much. Don't forget that these units are battery powered, so even if (fortunately) you don't use it very often, it's a good idea to check it once a month to make sure it's working for when you need it!